When you think about your good friends, many things come to mind: how bland life would be without them, how they make you laugh and smile when you need it, and how they are there to support you in any situation. You may even ask yourself the question — what would I do for them in return? For 24-year-old Graham McMillan, the answer is simple: there is simply no limit to what he would do for his friends. 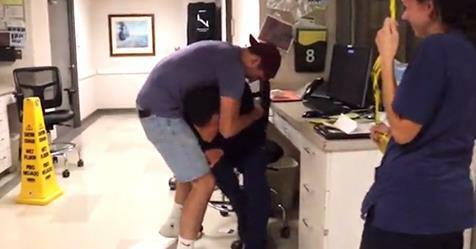 So, when his buddy Danny Kolzow, a 23-year-old nurse at Baylor All Saints in Fort Worth, TX, found himself in need of a kidney, McMillan didn’t hesitate to find out if he could donate one of his. As it turned out, he was a match! He decided to surprise his friend with the good news, and did so in the most incredible way. In this emotional clip, McMillan walks into the hospital where Kolzow works. He has balloons and a sign in hand that reads, “Heard urine need of a kidney, want mine?” It seems like the young man is quite the jokester! The moment Kolzow sees him, he understandably breaks down into tears. He can barely believe his good luck: not only does he get a kidney, but he knows that he also has a great friend who will be by his side through thick and thin. The gift of life and the gift of friendship are both priceless!